Marketing Futurist. VR, AR, MR Speaker, Evangelist and Producer. Writing the book on VR/AR Marketing. Snapchat this, Snapchat that. We hear about Snapchat's rise to social media dominance surpassing Instagram and Twitter on users and going head to head with Facebook on daily video views. Snapchat has also claimed the throne as the #1 app in the Appstore. 100+ million daily users who spend an average of 25 to 30 minutes on the platform each day. Close to 60 percent of users share content daily to friends or their stories. So we hear a lot about how big brands are crushing it on the platform and how political candidates are using geofilters and creating live stories that resonate with their target demographic. There are countless articles about ways small businesses can use Snapchat. I decided to go on the search for small businesses that are, in effect, using Snapchat in innovative ways. The examples you'll find in this article are of entrepreneurs who have invested their time and effort in really engaging with friends/clients and seeing a direct impact on sales and brand loyalty. Collin Austin is well known in Gainesville (home of the Florida Gators) as one of the top entrepreneurs in town. Austin began his journey a vision of scooters being the future form of transportation at the University of Florida. He is now the sole owner of News Scooters 4 Less (NS4L) and has used social media to promote his business, Snapchat being his favorite. "My favorite thing to do on Snapchat is give everybody a behind-the-scenes look at what is happening at our dealership," Austin said. 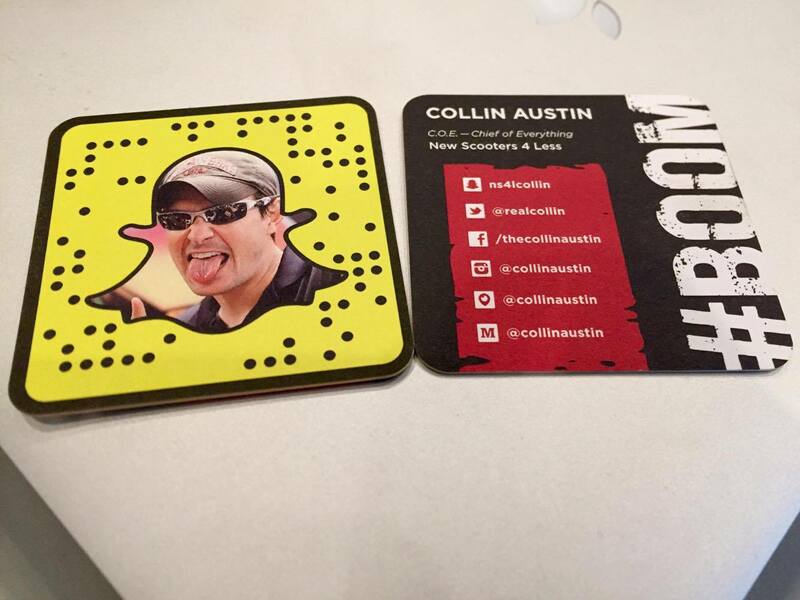 His business has recently moved to a new location and Austin has used Snapchat during the big move. He has engaged customers in the decision making of decorating the new location. "When it comes to paint I am asking opinions from customers and they thought it was the coolest thing ever." Austin said. "I'd get customer after customer just giving me their input." He even discovered a new way to give great customer service through the platform. Customers have messaged him on Snapchat to get help on how to fix their scooter problems. Austin is able to connect with the customers right away and help them troubleshoot their scooters. This has given clients instant access to Austin and NS4L's services. 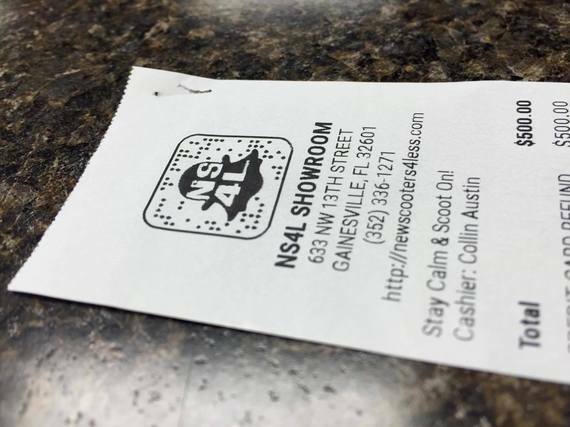 Austin said it has been a unique process trying to figure out ways to reach potential customers and increase NS4L's number of followers on Snapchat. 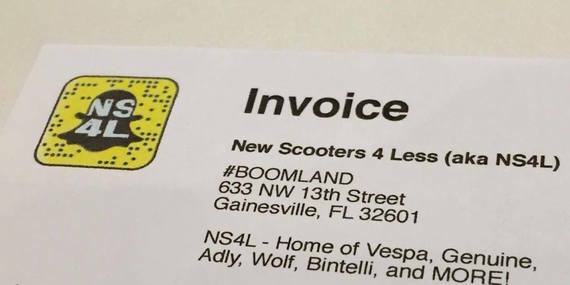 He created little social media Snapchat cards and stickers with the snapcode to give out and has even incorporated it into his clients' invoices and receipts. Austin goes on to say that it wasn't easy at first to gain the following his business has today. A few years ago he only had 5 people watch his Snap story daily, but he didn't let that stop him. "It's not something that you do only once a week or once month," he said. "If you can make the time, it's going to pay dividends." Austin is engaging with my customers on a daily basis and advises brands to do the same. He said businesses must make sure that whatever they are posting is interesting and to, "keep it fresh." Like all platforms, they start to age and Austin suggests brands to start building their following on Snapchat before everyone decides to get on it. "So if you have that following and know how to actively use and engage," Austin said. "You're just gonna be ahead of the game, so don't wait." When Doug Cohen played football for the University of Michigan in the 80's he would've never guessed that he would one day be connecting with millennials and Gen Z'ers on a mobile device. Now, with his talented photographer wife, Ally Cohen, they run Frameable Faces, a photo studio right outside Detroit. Among their offerings are family portraits and headshots, but what has become their biggest money maker is high school/senior portraits. Ally began taking photos professionally about 15 years ago and started Frameable Faces Photography. Seven and a half years ago, Doug and Ally Cohen opened a retail studio together. "Our top customers are high school seniors followed closely by family portraits," Cohen said. "After that it's a mix of professional headshots, some commercial work, boudoir & photo restoration." The Cohens began using Snapchat a couple of years ago, according to Doug. He said it was a fun way to capture things that would happen "in between" Facebook posts and tweets. They really enjoyed using the platform, primarily because not many adults or brands were using Snapchat. "Many laughed it off like it was a waste of time for brands. But they weren't wrong per se," Cohen said. "If we didn't have so many high school seniors as clients we wouldn't have used it either at the time." One day, the Cohens noticed something new with the platform. "Snapchat started to come out with updates," Cohen said. When marketers realized what Snapchat could do, the features and engagement levels of the platform exploded in the past few months, according to Cohen. "We use it to promote shows on Periscope, to highlight more behind the scenes action on photo shoots, and we've used a custom Frameable Faces geofilter," Cohen said. "The possibilities seem practically limitless." Cohen goes on to say that Snapchat has help them create and strengthen new relationships with other entrepreneurs using the platform. He said there are constant snapbacks and conversation threads going on all the time. They have also incorporated the use of the ghost codes app that helps users find and follow each other. Cohen said it has proven to help grow their following with over 100 downloads of their snapcode. "I've been preaching to other small businesses to start using live video and I still don't see enough doing it." Cohen said. "Snapchat is another way to fill in those live stream gaps in a running behind-the-scenes narrative that is fun and versatile as can be. I do recommend it!" Cohen even recommends reusing old Snap stories on other social media platforms, such as YouTube and Slinger. He said that Slinger provides great homes for repurposed and shareable content, especially with its new focus on vertical video. Cohen says that he doesn't have a traditional Snapchat ROI to measure whether the platform has brought in profits, but has been able to see his reach with the use of geofilters. "The snaps on my stories are viewed by around 150 people now per snap and I can SEE who those people are which is really cool," Cohen said. "There is no doubt in my mind that it is helping and will continue to help my business." Snapchat is growing rapidly and is making a significant impact on businesses and its users. The question is how can small businesses utilize Snapchat to reach more customers? The answer is simple according to Carlos Gil, head of global social media for BCM Software and avid Snapchat user. "The key to Snapchat success is to grow a local community of followers (focus on local vs. global) which can easily be done by having "Add us on Snapchat" call-to-actions on your website, Snapchat-code decals at your place of business, and having your own custom geo-filters available for nearby Snapchat users which can in return promote your brand to their friends, followers, and fellow neighbors," Gil said. For as little as $5, businesses can benefit from creating their own Snapchat geofilter. "Whether it's a dry cleaning business or a coffee shop if you have a physical business you should tap into geo-filters even if your business doesn't have a Snapchat account," Gil said. It is a low risk, low cost way of running hyper local ads on Snapchat which any small business can use to promote their brand through local Snapchat users and doesn't require a large budget. Every small business in America can use Snapchat to build a hyper local presence within the city or community they serve, according to Gil. 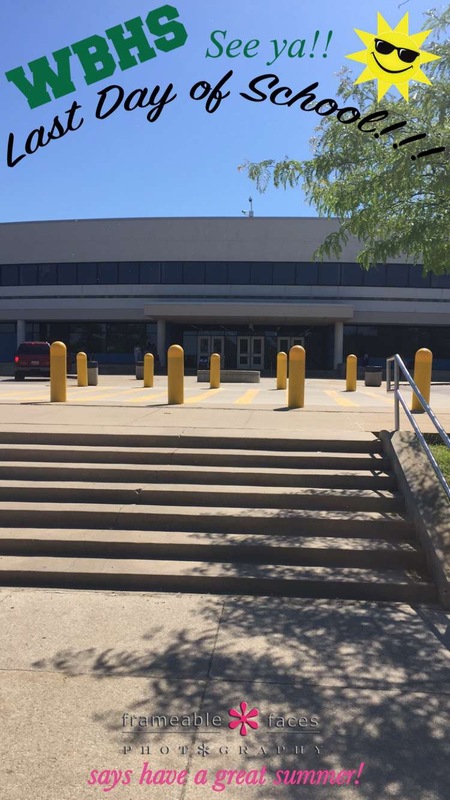 They can use, "geo-filters specific to their location and post community centric content such as photos and videos from events in their community such as sporting events, local high school games, grand openings in the community, etc." Gil goes on to say that no matter the size of the business the the same rules apply for all businesses. "It's all about building a following amongst consumers of your product or business and create relevant content for them. Big brands are spending six figures and above for one day worth of advertising on Snapchat and seeing high gains from impressions and brand awareness." As the platform continues to expand and onboard older demographics, brands can take a page from Frameable Faces and New Scooters 4 Less on how to use the platform with the millennials and Gen Z'ers that mostly inhabit it. Learning now how to use Snapchat effectively for big brands and small businesses will only help them know how to effectively engage the huge numbers of users that will eventually jump on the platform once mass adoption hits. Do you know of any other small businesses who are using Snapchat successfully? Send me a snap at @cathy.hackl.